Madame Tussauds is the famous wax museum in London. Marie Tussauds (1761-1850) exhibited replicas of people in the form of wax figures for the first time. Today Madame Tussauds is one of the most successful museums and exhibitions in Great Britain. Since 1970 there have also been branches of Madame Tussauds reproductions of famous wax figures in other countries. In the meantime, more than 20 branches have been established worldwide. The first was Madame Tussauds Amsterdam in 1970, one of which has been on the Prater in Vienna since 2011. It is a new sight and attraction that rightly attracts many visitors. One finds the wax figure museum very easy. 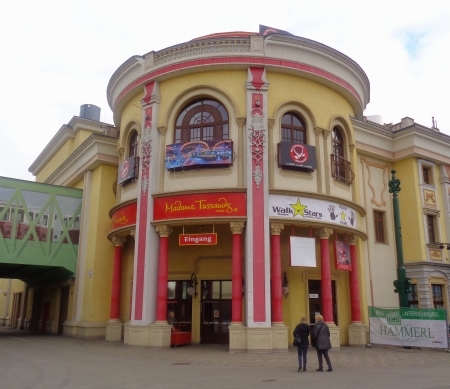 It is directly behind the entrance to the amusement park Prater, if you come from the subway (station Praterstern). Among the replicas in Madame Tussauds are international stars like Elvis Presley, Johnny Depp, David Hasselhoff and Barack Obama and many, many more. But the wax replicas of many Austrian celebrities such as football players Hans Krankl and David Alaba are also great. Winter sports enthusiasts, such as skier Hermann Maier, should of course not be missing in Austria as a skiing country. The perhaps most famous Austrian, the composer Mozart, is also exhibited as a wax figure. Other musical personalities include Johann Strauss, Peter Alexander and Falco. Arnold Schwarzenegger is currently (March 2017) in the entrance area, you can admire him without paying admission. Especially worth seeing in our opinion is the completely new part (opening was early 2017) „Sisi Uncovered Experience“. It tells the story of Sissi (Empress Elisabeth of Austria) and her husband Emperor Franz Joseph I using state-of-the-art 3D technology. The museum visitor can even smell typical smells from that time. Opening hours 2019 Madame Tussauds Vienna: The Wax Museum on the Prater is currently (Feb 2018) open daily from 10 am to 6 pm. Admission prices: 2019 Madame Tussauds Vienna: It is a private museum which lives only on admission. The entrance fee at the box office is 23 Euro per person (as at the beginning of 2018). As there is often a lot going on at the box office (queues, waiting times) it makes sense to buy a ticket in advance on the Internet. Various providers offer such tickets. You should buy a ticket for the Madame Tussaud with preferred admission (also called Skip-The-Line-Ticket or ticket without queue) online. With these tickets you don’t have to queue and you save a lot of time. A good website for tickets to Madame Tussaud is Getyourguide. Advantages of online tickets: It is well-known, respectable web page, tickets cost 23 euro like at the museum, free cancellation up to 24 hours before possible, you do not have to print the tickets(on the Smartphone is enough also). At Getyourguide there are also other tickets for Vienna, like for the Ferris wheel in the Prater, for the Spanish yard riding school, the zoo etc. No admission with the Vienna Pass: Tourists can now also enter Madame Tussaud free of charge with the great Vienna Pass. It also applies to 60 other attractions such as the neighbouring Vienna Giant Ferris Wheel. The Vienna Pass is also available at Getyourguide. How to get to Madame Tussauds Vienna by subway: The best station is Praterstern. In addition to the subway, the S-Bahn also stops here. From Praterstern station it is less than 6 minutes on foot to the wax museum.